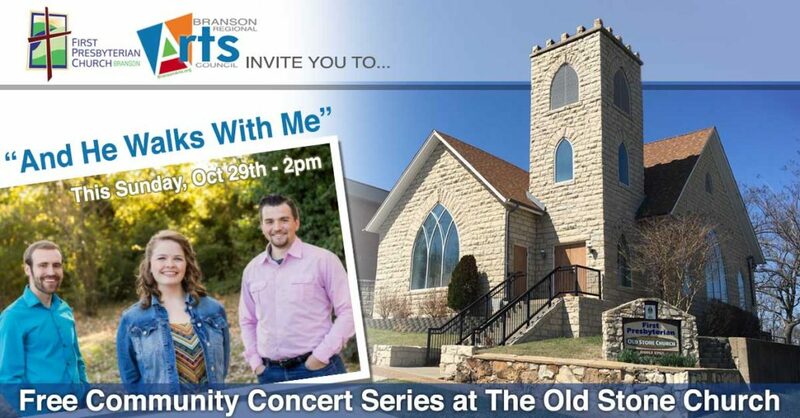 The Branson Regional Arts Council and First Presbyterian Church will present “And He Walks with Me” as part of the Old Stone Church Community Concert Series this Sunday, October 29, 2:00 p.m. Musicians Elizabeth Stuart (soprano), Josh Whisler (tenor), and Josiah Mullins (bass) will present a variety of musical selections ranging from familiar hymns to music of the Great White Way. While the concert is free, donations for the group will be accepted. The Presbyterian Old Stone Church is located at the corner of 4th and Pacific Streets in Branson, Missouri. What is the exact address of old Stone church at 4th & Pacific?